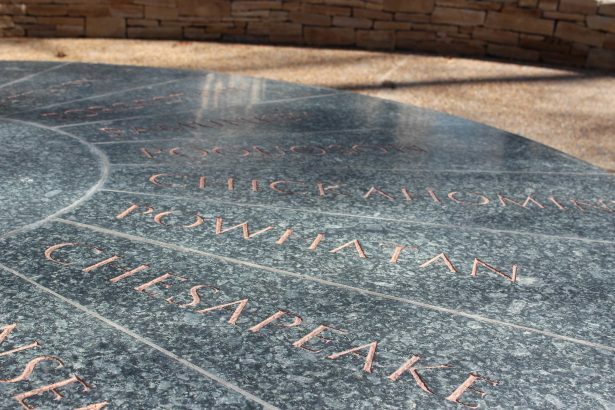 After years of planning and several months of construction, a monument honoring the lives, legacy, and achievements of Native American tribes in Virginia has been completed and now stands on the grounds of the state Capitol. State officials are planning a ribbon cutting for the monument on April 17. “I think everyone who has seen it is very much in awe and approves of what has been installed,” said Christopher K. Peace, R-97th District, vice chairman of the Virginia Indian Commemorative Commission. 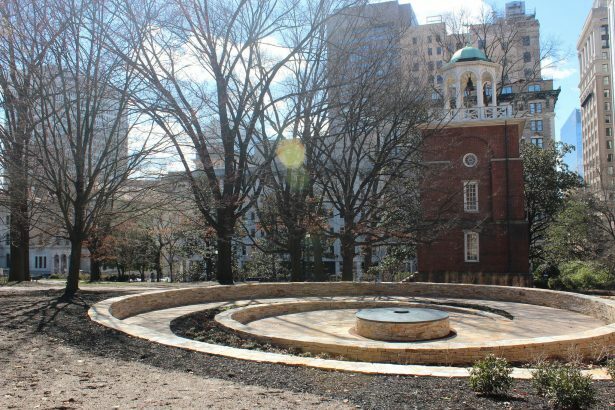 The monument, titled “Mantle,” gets its name from Powhatan’s Mantle, a deerskin cloak said to be worn by the Native American chief; and its spiral shape was inspired by the nautilus, the self-replicating living fossil. Commission member Frances Broaddus-Crutchfield said the design symbolizes the endurance of Native American tribes. “We interviewed various artists, and Alan Michelson was the one who had the concept that we thought best represented what we were aiming for, which was the walkway,” Broaddus-Crutchfield said. Funding for “Mantle” came from the Running Strong for Indian Youth Foundation as well as private contributions and other fundraising efforts. “The Capitol Square Preservation Council and the Virginia Capitol Foundation have been masterful in the fundraising efforts — the most generous of which has come from members of our own commission,” Peace said. The ribbon-cutting ceremony, planned for the morning of April 17, will be open to the public, Peace said at the commission’s meeting on Friday. Gov. Ralph Northam and leaders of Virginia’s Native American tribes are expected to attend. While the monument has brought praise, one Virginia tribal leader said he is more focused on daily challenges. But Karenne Wood, a member of the Monacan Indian Nation and director of the Virginia Indian Heritage Program at the Virginia Foundation for the Humanities said in an interview that “Mantle” is an important and unique tribute to all Native Americans.